Viral infections are common and can cause anything from the common cold to more serious diseases. These diseases are caused by pathogenic viruses, which are microorganisms that enter the human body. Once in the body, the virus will start to reproduce and multiply. They are often easily spread from one to another. Even though millions of viruses are thought to exist, only around 5,000 viruses have been identified by scientists today. The Ebola virus does not hold a rich history like some other viral infections we know today but is still an important disease to become educated on. The disease can be deadly, especially when unnoticed. Even though no treatment methods have been identified, certain therapies can help improve the chance of recovery. In this post, we’ll cover all the most essential details that the population should know about the Ebola viral infection. Once a patient has been exposed to the Ebola virus, it may take anywhere between two and 21 days before they become infected with the disease and start to show signs of the infection. Once infected, symptoms often tend to develop suddenly. The patient may also develop symptoms associated with an impairment in their liver function or symptoms linked to kidney failure. Additionally, bleeding may occur – externally and internally. Some patients tend to start bleeding from their gums. Blood may also appear in the patient’s stools. Ebola is a potentially deadly disease. In the past, the risk of fatality after contracting the viral infection has deferred significantly, mostly between 25% and 90%. This means that, in some cases where an outbreak occurred, most people who got infected died. In other cases, only one in four patients died – most likely due to better care and treatment protocols being put in place at the right time. At the moment, the World Health Organization has declared the risk of fatality for the Ebola infectious disease as 50%. If the patient meets these criteria, then further testing will commence. The patient will be isolated from individuals who have not yet been infected until further tests confirm whether they have contracted the viral infection or not. Thereafter, blood samples will be collected and sent to a laboratory for testing. Scientists will be able to determine with the Ebola virus is present in the patient’s blood. If not, they will be able to conduct further tests to see if another type of virus might be causing the patient’s symptoms. Are There Treatments For Ebola? No medications have been developed specifically for the treatment of Ebola. Many patients who are infected will go on to die, but patients do have a chance to survive. Early detection of the disease is vital to ensure a higher chance of survival for the patient. Even though no medications are available to treat the disease, several protocols can be initiated to help relieve the symptoms that a patient is experiencing, as well as to help them recover. This may include mechanisms for blood pressure regulation, the delivery of oxygen should the patient has problems breathing, and providing the patient with adequate amounts of fluid. Special fluids may also be used to replenish electrolytes in the patient’s body. Pain and fever can be treated with certain types of medication, but it is important to avoid any type of medication that may cause bleeding – Ebola itself causes the patient to bleed. Can The Ebola Viral Infection Be Prevented? No licensed vaccine is available to prevent the infection once a patient is exposed to the virus that causes the disease. A recent breakthrough in Canada, however, has given the world hope. A paper published on ScienceDaily explains that a recent study conducted on a new vaccine that is in development showed a positive outcome. 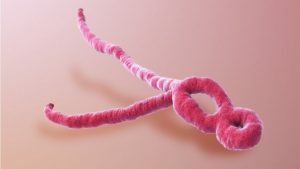 A significant increase in antibodies against the Ebola virus were observed among participants within six months after they were given the vaccination. While this vaccine still needs further testing, it has taken the healthcare industry one step closer to more effectively preventing Ebola epidemics. Where Is Ebola An Epidemic? The most recent outbreak of the Ebola virus has occurred in the Democratic Republic of Congo. The World Health Organization has recently adjusted their risk rating for the area from “high” to “very high,” after a report of Ebola was confirmed in a major city that is populated with millions of people. Additional cases were confirmed in nearby cities as well. Apart from this latest outbreak, a previous outbreak was reported in 2014 in West Africa. While the outbreak lasted for two years, the area is still considered a high-risk region. Area of West Africa that was most severely affected included Sierra Leone, Liberia, and Guinea. In addition to West Africa, travellers are also advised to be prepared and take optimal precautionary steps to help them avoid the Ebola virus if they are planning to travel toward central Africa or the sub-Saharan African region. The majority of cases related to outbreaks of this disease usually leads back to African countries, but people from other countries can also be at risk – especially when an infected person travels back home without knowing they are carrying the virus with them. Even though not an epidemic in most regions of the world anymore, travellers should be wary of the Ebola virus when visiting international destinations. The virus can cause unpleasant symptoms and may even lead to fatal complications. Knowledge about the potential symptoms can also help individuals identify the presence of the virus early on, leading to better supportive care and appropriate treatment protocols to help minimize the risks. While no licensed vaccines against the virus have been approved yet, certain vaccines are currently undergoing testing to help reduce the widespread prevalence of the disease in some areas of the world.